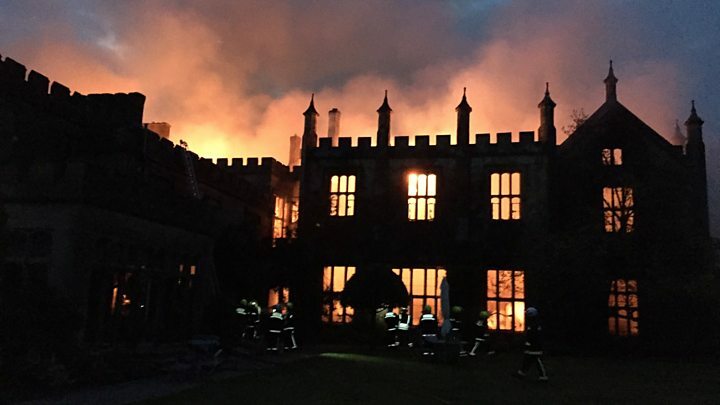 A 16th Century stately home has been severely damaged by an overnight fire. Fire crews were sent to Grade I listed Parnham House in Beaminster, Dorset, following reports of the blaze. Photographs shared on social media showed the Elizabethan building well alight. A spokesman for Dorset Police said the cause was unknown, but it was being treated as suspicious. He added it was believed no injuries had been sustained. The spokesman said emergency services were alerted to an "extensive fire" at 04:10 BST. Parnham House was described as "architecturally brilliant" in a 2009 Dorset Life article. It was home to the Strode family, prominent aristocrats in the 16th Century, for 200 years. It was later used as a country club and nursing home. In 2001 it was refurbished by a private owner. Much of the current design was created in 1810 by John Nash, an architect who worked on the 19th Century enlargement of Buckingham Palace. Evidence of his work includes distinctive winding staircases and stone mullioned windows. The house is set away from the road and sits in grounds that include stone statues and topiary that has remained unchanged for centuries.